Rich in history and tradition, Cave Hill Cemetery has long been recognized as Kentucky's premier cemetery. A casual stroll down its tree-draped avenues reveals more than just rows of monuments — the tombstones represent lives with rich stories to be told and passed down through generations. A further glance at the epitaphs recorded on the monuments — like James Guthrie's, which reads, "Would you know his worth, ask his neighbor, his city, his state and his country" — makes one wonder what each person did to receive such lasting recognition. "Local historian Bryan Bush has done a tremendous job documenting the lives of Civil War leaders now 'Resting in Peace' in Cave Hill Cemetery." As one of the most decisive events in the history of the United States, the Civil War pitted brothers against brothers and was an event that involved an entire nation. Louisville, Kentucky was a geographically central location during the Civil War and had many connections to both the Union and Confederacy. Cave Hill Cemetery was, therefore, an ideal place to bury both high-ranking officers and ordinary citizens. There are 6,100 Union soldiers and 228 Confederate soldiers buried in the National Cemetery, but this does not include the numerous soldiers who are buried throughout the massive grounds. The Cave Hill Heritage Foundation is delighted to have this extraordinary collection of stories officially recorded in such a clear and easy-to-use guidebook. Visitors to Cave Hill Cemetery will enjoy and appreciate the detailed cemetery maps, photographs, and well-researched history of the cemetery's role in the Civil War. 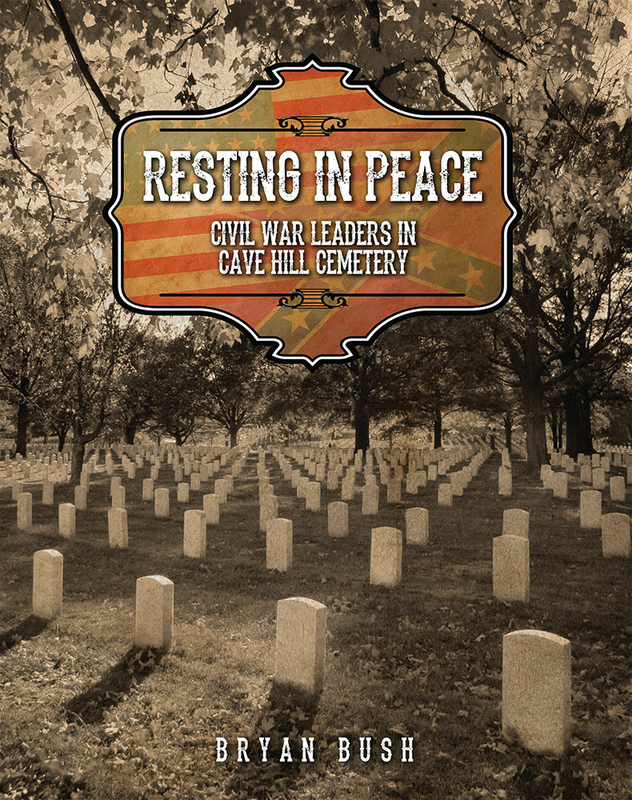 Resting in Peace: Civil War Leaders in Cave Hill Cemetery is a wonderful resource and a treasured collection of stories from the Civil War that are permanently recorded in stone. Cave Hill Heritage Foundation, Inc.
Bryan Bush was born in 1966 in Louisville, Kentucky, and has been a native of that city ever since. He graduated with honors from Murray State University with a degree in History and Psychology, and received his Master's Degree from the University of Louisville in 2005. Bryan has always had a passion for history, especially the Civil War. He has been a member of many different Civil War historical preservation societies; consulted for movie companies and other authors; coordinated displays of various museum articles and artifacts; written for magazines, such as Kentucky Civil War Magazine, North/South Trader, and Back Home in Kentucky; and worked for many different historical sites. Bryan has fought hard to maintain and preserve Civil War history in the Western Theater. In 1999, he published his first work: The Civil War Battles of the Western Theater, which was given good reviews by North/South Magazine, and Kentucky Monthly. Kentucky Monthly said Bryan Bush's The Civil War Battles of the Western Theater "has with his first book created a needed addition to any serious Civil War library." His additional publications include Terry's Texas Rangers: The 8th Texas Cavalry; My Dearest Mollie: The Civil War Letters of Brig. Gen. Daniel F. Griffin, 38th Indiana Volunteer Infantry; and Lloyd Tilghman: Confederate General in the Western Theater. Bryan was a contributor to Kentucky's Civil War, Louisville During the Civil War: A History and Guide; Lincoln and the Speeds: An Enduring and Devoted Friendship; Butcher Burbridge: Union General Stephen Gano Burbridge and his Reign of Terror over Kentucky; Louisville's Southern Exposition: The City of Progress; and Haunted Battlefields of the South. Bryan Bush has also been a Civil War re-enactor for fourteen years, portraying an artillerist. For five years, he was on the board of directors and curator for the Old Bardstown Civil War Museum and Village: The Battles of the Western Theater Museum in Bardstown, Kentucky. He is currently a board member for the Louisville Historical League and a contributing editor for the Kentucky Bugle.